Translation tips: Comma or period...or something completely different? We are often approached to provide guidance on what is the most common way of using decimal dividers and thousand separators for the various languages that we translate into. While everyone is aware of US English using periods for decimal division and commas to separate thousands in big numbers, the issue is somehow obscure when it comes to all the different lan­guages used in Europe. In US English, the value of pi is 3.14 while a million is written as 1,000,000 with comma separators. This system is also used widely throughout Asia and in almost all English speaking countries. In Spain, pi is written like “3,14” and everyone would like to win “1.000.000” Euro in a lottery. Many other European countries apply similar punctuation in numbers, but there are exceptions. In Germanic languages, i.e. German, Dutch, Danish, Norwe­gian and Swedish, the decimal comma is also standard and pi is written as “3,14”. However, while a million can be written like what is the custom in e.g. Spain, there is now a general trend to instead use nonbreaking spaces and people like to win “1 000 000” Euro instead on the lottery. 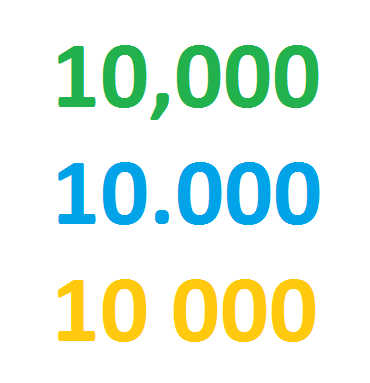 To complicate things, for the Germanic (and also Slavic) languages there is also a general preference to not use any divider in single thousand numbers. So you would e.g. pay “€1500” for a very good bicycle and “€9000” for a decent car. If you add German value added tax of 19%, the final price becomes “€10 710” (yes with a space) for the same car. This trend of omitting the separator is also picking up in many other European countries, and it is a commonplace practice today. We have learned that many of our clients are not aware of this. As a result, we have developed special QA style sheets in which we have recommendations for all the 70+ languages we translate into. Clients can accept these recommenda­tions or enter their own preference for the various languages that projects should be translated into. It is even possible to enter non-standard practices, e.g. to omit all dividers in thousands and larger, for example when translat­ing very technical documents where numbers should simply remain the same in disregard of what language they are translated into. The information in the style sheets is passed on to our translators and proofreaders as ‘mini rules’ so they can adhere to your pref­erences while handling your projects. Please contact our project manager for more information on these style sheets and how you best can use them to your advantage. Multilingual documentation has become increasingly challenging over the years – quality in translation must be maintained while we match clients’ detailed specifications accompanied with short deadlines. One translator can only produce so much in a day, and splitting projects on multiple translators usually affects the overall style and draw negative feedback from clients. As we accept clients’ requests with increasingly shorter delivery terms, it is unrealistic to make translators remember each and every instruction and use reference material that overwhelm rather than help. We have taken this issue into serious consideration to be able to handle volume projects in short time frames without this affecting the quality. So, through extensive development and testing, we have developed an innovative translation platform called “iQube”. TM engines – friends or foes? iQube™ is a smart Translation Memory (TM) solution developed in-house at idioma. It represents a 3-dimensional service: Quality, Quantity, and Quickness. Many TM tools exist in the translation industry today, each with different advantages. We have tried to implement most of these in iQube while we have kept an extremely simple interface. From experience we know that the majority of translators struggle in a TM environment, many are lost in all the available settings and almost everyone complain that tags in existing TM systems make actual translation difficult and post-checking even more so. Style, being another issue, is difficult to unify as every translator has different writing styles. As such iQube was designed as an intelligent TM platform, where emphasis was on a clean work environment for the translator to make it easier to concentrate on the translation task and subsequent verification of translated documents. Integrated QA! idioma’s CrossCheck® QA application is completely integrated in iQube – each and every segment that is translated and verified is subject to mandatory QA checking to make sure Quality is not compromised. Highly customizable! iQube™ can be adapted to match client specifications – it notifies translators working on projects about client preferences, even checking to make sure writing rules are respected. Team work! If you have a tight deadline and are in a hurry, we can divide your project among multiple translators who will work in real time together against the iQube™ platform so translators can check and reuse each others’ work. This common way of working ensures unification of style in translated content. Process automation! As translation projects become increasingly complex with unification and detailed specifications constituting core issues, iQube™ systematizes glossary use, automates QA checks, and style sheet loading, this way contributing to Quickness. 1 more reason – it is Free! A fifth reason should also be mentioned. iQube™ is offered for free use to all idioma suppliers. There is no need to invest 50, 100 or even 1,000 Euro in an expensive commercial solution that you don´t know will be useful or even used again. The iQube™ software solution also undergoes continuous change to make sure it is always up-to-date, making it an ideal work tool for translators and reviewers. The better TM engine, the better translation? Spanish (español) or Castilian (castellano) is an Indo-European, Romance language that originated in northern Spain and gradually spread in the Kingdom of Castile eventually evolving into the principal language of government and trade (mainly thanks to King Alfonso, who standardized the language for official use already in 13th century). It was taken to Africa, the Americas, and Asia Pacific with the expansion of the Spanish Empire between the fifteenth and nineteenth centuries. By the time of Columbus exploring the New world, Spanish reached the point where it would be understandable even today. The authority in terms of standard Spanish is The Royal Spanish Academy, that has been producing grammar guides and dictionaries since 18th century. Spanish is the official language of more than twenty countries, mainly in the Americas besides Spain, but it is generally spoken on all five continents. It's also one of the EU languages as well as one of six official languages of the United Nations. Interestingly, after Chinese Mandarin, is Spanish language most spoken around the world by the number of speakers who has it as a mother language. Spanish language is spoken as the first and second language by between 450 and 500 million persons. Spanish is said to be quite easy to learn, also due to being one of the most phonetic languages in the world. The Spanish, as other Romance languages, is a modern extension of spoken Latin (also called Vulgar Latin) from around the 3rd century A.D. However, the evolution of Spanish language was heavily influenced by Arabic and later also English. The resemblance between English and Spanish is quite visible, while the two languages share a large volume of common words and expressions. Every year, spring in Japan gives an energy boost and invites to festive get-togethers. Spring in Japan indicates change with new beginnings and endings. The business year and even the school year both end in March and begin anew, fresh in April – around the same time as the cherry tree, Sakura, blossoms. It is a season where college graduates say their goodbyes and the young work force begins new careers. People across Japan wait for the Sakura to bloom in their region. The Sakura Zensen, or “Cherry blossom front”, indicates in what regions in Japan the Sakura is blooming. Naturally, the flowers start blooming from the south as it gets warmer, working their way up to the north following each of Japan’s islands in her archipelago. Defend your spot under the tree! Some people even bring private electric generators and floodlights so they can enjoy the Yozakura, “cherry blossoms at night”. Aoyama Bochi, the big cemetery in Aoyama in central Tokyo, is a famous Hanami spot and extremely popular for its Yozakura. The cherry blossoms are especially pretty at this sacred place, and throughout the night you will see many people gathering. Being a cemetery, there are graves everywhere but it doesn't seem to bother anyone. People enjoy Hanami, celebrating their goodbyes and new beginnings with those who have long since passed away.